The 18-hole Stadium Course at TPC Scottsdale in Scottsdale, Arizona is a resort golf course that opened in 1986. 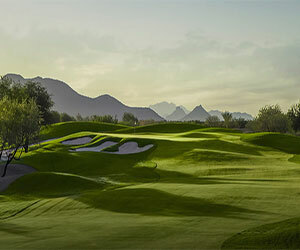 Designed by Jay Morrish and Tom Weiskopf, Stadium Course at TPC Scottsdale measures 7261 yards from the longest tees and has a slope rating of 142 and a 74. The 18-hole Longbow Golf Club in Mesa, Arizona is a public golf course that opened in 1997. Designed by Ken Kavanaugh, Longbow Golf Club measures 6750 yards from the longest tees and has a slope rating of 128 and a 71.8 USGA rating. The course features 4 sets of tees for different skill levels. Arguably the golf capital of the United States, it's hard to beat the weather and the number of high-quality golf courses in Scottsdale, Ariz. The average high in December and January of 68 degrees caters to snowbirds, and though temperatures eclipse 100 degrees in the summer, Golfers on a budget can find some real savings with green fees half off or more during the hot months. There are more than 200 courses cut out of the rocky terrain of the Sonoran Desert in the area. And there are dozens of must-play golf courses, from the Stadium Course at TPC Scottsdale, home to the Waste Management Phoenix Open, to the Monument and Pinnacle Courses at Troon North, and the Talon and Raptor Courses at Grayhawk Golf Club, a venue associated with Phil Mickelson, who played college golf at nearby Arizona State University. Getting to Scottsdale is easy, too. It's just a half hour from Phoenix Sky Harbour Airport, and is only a few hours from Los Angeles. Scottsdale is hardwired toward keeping tourists happy. This affluent city ranks third, after New York City and Las Vegas, respectively, for having the most AAA Five-Diamond hotels and resorts in the United States. The Phoenician, Camelback Inn, Four Seasons Resort Scottsdale at Troon North, the Boulders Resort & Golden Door Spa in nearby Carefree, and the Fairmont Princess Resort and Spa have all been so honored in recent years. All these resorts add up to more spas per capita than anywhere in the country. If you can't relax here, then you're out of luck. The culturally rich Scottsdale includes more than 125 professional art galleries and studios, rivaling trendy Santa Fe, N.M., and even New York City. There's something always cooking in town: an annual auto show in January, a culinary festival in April, a film festival in September-October, and a fashion week in November. Scottsdale gives off a party vibe without being over the top. Bars and restaurants are aplenty, all supported by the region's avid sports scene. The NBA's Phoenix Suns, the NHL's Phoenix Coyotes, the NFL's Phoenix Cardinals and MLB's Arizona Diamondbacks (and don't overlook the WNBA's Phoenix Mercury) keep fans cheering in every season. For those looking to get away from the crush of these sprawling metropolises, hiking, mountain biking, rock climbing are all nearby at the Camelback Mountain or the McDowell Mountains in the McDowell-Sonoran Preserve. Lakes tucked inside desert canyons are great for boating and fishing.